AFP: Hundreds of tonnes of rotting garbage piled up in Sri Lanka’s capital Tuesday after the main rubbish dump was shut following an accident that killed over 30 people. Authorities sealed the massive 300-foot (90-metre) rubbish mountain on the northeastern edge of Colombo after it collapsed Friday, destroying 145 homes nearby and burying victims in a garbage landslide. Military spokesman Roshan Seneviratne said hundreds of troops were still searching for six people missing since the accident, but authorities were not hopeful of finding any survivors four days on. 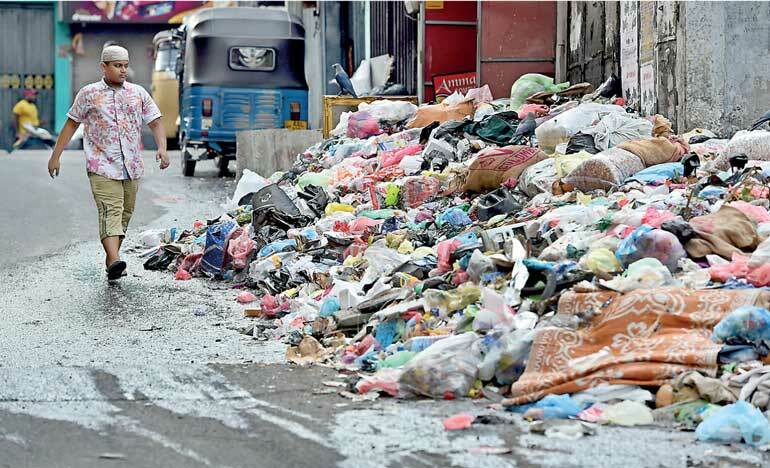 The Colombo Municipal Council was scrambling for new locations to dump the roughly 800 tonnes of garbage produced every day in the capital, as crows and stray dogs picked through bags of reeking garbage left on city streets. The council sought permission Tuesday from a local magistrate to access another tip outside the city limits, promising it would clear the four-day backlog of trash within 24 hours. “We are finding new locations. By noon Wednesday I am hopeful of restoring normality in clearing the garbage,” Commissioner V.K. A. Anura told AFP. The death toll from Friday’s accident climbed to 30 on Tuesday as another victim was found, Seneviratne said. “We are still carrying out clearing of damaged homes,” he told AFP. Officials said 1,700 people living near the tip had been relocated to temporary shelters while the government searched for alternative accommodation. A night of heavy rain, followed by an outbreak of fire, destabilised the 23 million-ton garbage heap, causing its collapse as Sri Lankans celebrated the traditional new year. Parliament had been warned the vast tip posed a serious health hazard, and that a long-term solution was needed to dispose of Colombo’s trash. Disaster management minister Anura Yapa said the loss of life could have been avoided had local residents acted on warnings to move, issued as recently as a fortnight ago. But activists have complained that ad hoc compensation and relocation was not the answer to a festering problem that politicians have been unable to resolve for years.